Escucha Cadena Mix Web Radio con nuestraaplicación gratuita para Android®! Lo último de la movida tropical en un solo lugar CUMBIA PARATODOS. Cumbia a un solo click! 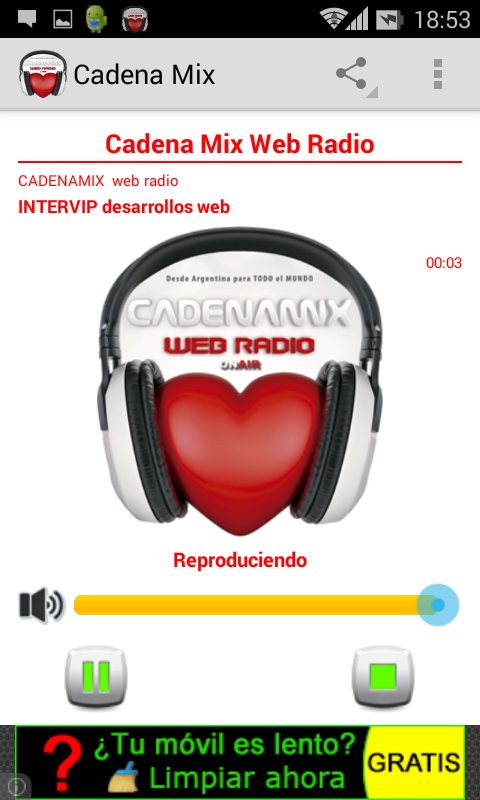 Listen Mix Web RadioCadena with our free app for Android ®! Works with 3G, 4G and Wi-Fi. Newest tropical moved in one place CUMBIA FOR ALL. Cumbia just aclick away! Last update: February 14th, 2017Listen the most important tropicalradio of Argentina, FM Pasion 102.7 Mhz on your Android® device andin HQ!Works with 3G, 4G and Wi-Fi. Escucha Radio 1010 AM con nuestra aplicacióngratuita para Android!Funciona con 3G, 4G y Wi-Fi.El 19 de abril de 1935 aparece en el 1010 AM del dial La Voz delAire, la ¨hermana¨ de Radio Carve, con una programación netamentedeportiva.Con el devenir del tiempo, dicha emisora cambió de nombre y sedenominó “Radio El Tiempo” con su programación dedicado a la músicaen sus diferentes géneros: clásica, melódico, tango, rock ypopular.Más adelante, en octubre de 1993, paso a denominarse “RadioNuevotiempo” con una programación más periodística, informativa,cultural y deportiva.Hace ya 2 años, con la incorporación del nuevo transmisor, laemisora cambia nuevamente su nombre a la actual denominación ”Radio1010 AM”, regresando a su orígenes con una programación netamentedeportiva, como lo dice nuestro slogan: “Radio 1010AM más deportivaque nunca”!! !Radio 1010AM pretende ofrecer una programación variada y de buennivel, que defienda y contribuya a la construcción de una nuevapraxis de la comunicación social.Incorporando la buena calidad de los contenidos que descubrenraíces e identidades con un puente con la juventud y su nueva formade ser y de comunicarse.Las nuevas formas de uso del lenguaje en el mundo moderno vancambiando las modalidades y los estilos de comunicación y la radiono debe quedar ajena al proceso.Listen Radio 1010 AM withour free app for Android!Works with 3G, 4G and Wi-Fi.On April 19, 1935 on the AM dial 1010 La Voz del Aire, the sisterof Radio Carve with a distinctly sports programming.With the passing of time, that station changed its name and wascalled "Radio Weather" with its programming dedicated to music indifferent genres: classical, melodic, tango, rock and folk.Later, in October 1993, was renamed "Radio Nuevotiempo" with amore journalistic, informational, cultural and sportsprogramming.And two years ago, with the addition of the new transmitter, thestation again changed its name to the current name "Radio 1010 AM",returning to its origins with a distinctly sports programming, asour slogan says: "Radio 1010AM sportier than never "!! !Radio 1010AM aims to offer a varied and of good standardprogramming, defend and contribute to the construction of a newpraxis of social communication.Incorporating the quality of content they discover roots andidentities with a bridge with youth and their new way of being andcommunicating.New forms of language use in the modern world are changingmodalities and communication styles and the radio should not remainoutside the process. O aplicativo para Android da Rádio Somjah HD! com reggae 24 horaspor dia. Reggae para quem sabe de reggae. Compatível com conexões3G - 4G - Wi-Fi ! The Android app Somjah HD Radio! with reggae 24hours a day. Reggae to reggae who knows. Compatible with 3Gconnections - 4G - Wi-Fi! Descarga nuestra aplicación gratuita paraAndroid y disfruta de la programación de Radio Fides Bolivia.Funciona con 3G, 4G y Wi-Fi.Download our free app forAndroid and enjoy the programming of Radio Fides Bolivia.Works with 3G, 4G and Wi-Fi. Escuchá Radio Rivadavia AM 630 Khz con nuestraaplicación gratuita para Android®Funciona con conexiones 3G - 4G - Wi-Fi.Listen to Radio RivadaviaAM 630 Khz with our free application for Android®Works with 3G connections - 4G - Wi-Fi. Listen Classic FM 91.3 Mhz from Posadas,Misiones - Argentina with our free application for Android® and inHQ!It works with 3G, 4G and Wi-Fi.Music CLASSIC is defined as retro-soft, great successes thatexceeded the barrier of time so that we desire to hear today withthe same enthusiasm and the same passion as in `50,` 60, `70,` 80and `90.Our programming technically called "linear", this means that inmost programming we have no compartments, or separate programs thatdiffer, we maintain a style for 24 hours.Radio basically aimed at an audience of 25 to 50 years,understandably extending the range up and down, Target ABC1 (highcultural level and middle).This public, is currently the most consumer because it has themeans to do so and identifies the products you want, throughCLASSIC. RADIO CRISTIANA GUATEMALA surge ante la necesidad de alojar masoyentes para nuestra estación, por lo cual hemos tomado la decisiónde obtener un nuevo servidor de radio.Por que Otra Radio?.La ideade otra radio es tener dos servidores diferentes, porque al momentode que nuestra radio se apague por exceso de oyentes, nuestrosegundo servidor ocupe el puesto para evitar que nos quedemos sinaudio, inconveniente que tuvimos al inicio de nuestra radio porinternet.GUATEMALA CHRISTIAN RADIO arises from the need toaccommodate more listeners to our station, so we decided to get anew server radio.Why else Radio ?.The idea of ​​another radio is tohave two different servers, because when our radio off excesslisteners, our second server occupies the position to avoid we runaudio, inconvenient we had at the beginning of our Internet radio. Descarga esta aplicación gratuita para Androidy disfruta de la programación deportiva de radio Sport 890Uruguay!Funciona con 3G, 4G y Wi-Fi.Update:12 Junio 2015 - Se actualiza la app a la nueva dirección deemisión y se encuentra nuevamente funcional.Download this free appfor Android and enjoy sports programming radio Sport 890Uruguay!It works with 3G, 4G and Wi-Fi.Update:June 12, 2015 - the app is updated to the new emission directionand is again functional. Radio Mixfm. Cadenamix. The Radio leader in the community ofCantabria, Spain. Here you will find entertainment, sports andmusic. We got the whole community of Cantabria in FM and transmitto the whole world through internet.